Retro styled kitchen in red from the USA. New for this year, EXCLUSIVE TO HIBBA TOYS IN THE UK. This exceptionally high quality wooden kitchen play set is the ideal kids nursery toy, great for role play. Made from high quality wood, fantastic new retro kitchen with built in play fridge-freezer, microwave, oven, sink and hob. Plus taps and dials to turn. There is plenty of storage space for all your play kitchen kit. This kitchen can be positioned however you like for easy access, then pushed back against the wall to tidy away. Any young, imaginative child is sure to love playing with this colourful kitchen. 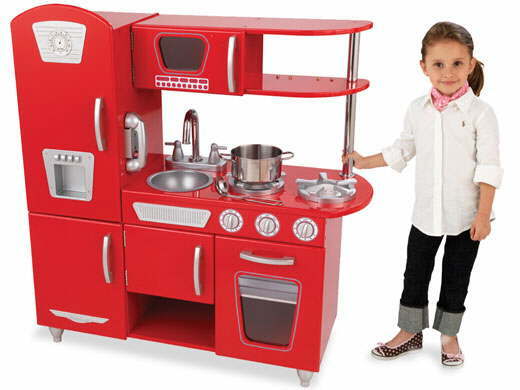 Our Red Retro Kitchen Centre would make a great gift for any of the young chefs in your life.